AN Abigail Marano sighting in the UAAP men’s basketball games of late? Don’t be surprised if you see the popular lady spiker from La Salle doing production work during basketball games of the UAAP these days as the reigning Most Valuable Player is doing her on-the-job training with giant network ABS-CBN Sports. And she's taking it seriously. 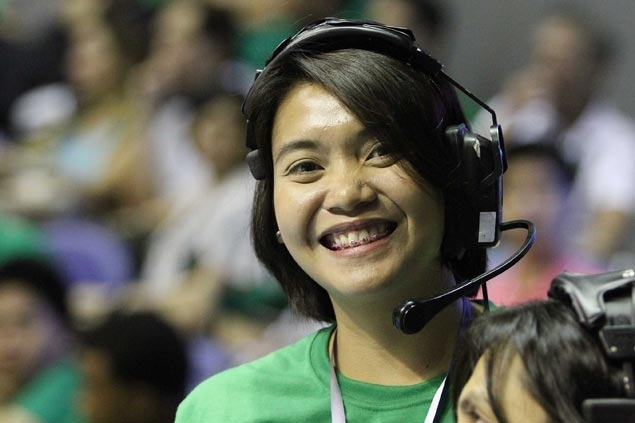 For someone used to playing in front of the cameras during the UAAP volleyball matches, Marano now finds herself working behind it as part of the ABS-CBN Sports production crew. As part of her on-the-job training, Marano either works at courtside or inside the network’s OB van just parked outside the playing venue. Taking up Philippine Studies major in Filipino Mass Media, Marano said she chose to take up her on-the-job training at ABS-CBN since she was curious on how the network does the production side of a live sports coverage. Marano said that doing production work has been a dream of hers since she was a child. “I’m used to seeing myself on television. Pero this time, masarap ‘yung feeling kasi ako naman ang kasama sa production. This is my dream simula nung bata. I’m happy and lucky to be part of ABS-CBN Sports,” said Marano. Required to complete the 100 hours of on-the-job training, Marano said she does about everything from floor directing to doing the slow motion for the broadcast of the games. But definitely, she’s not complaining. Her presence during games has also created perceptions among fans that Marano is now working for ABS-CBN. “Marami ngang nagtanong kung nag-wo-work na raw ako sa ABS, sabi ko hindi pa. May isa pa akong term,” said Marano, who said she will still play her final year of eligibility with the Lady Spikers this season. Once she graduates, Marano definitely wants to work with the country’s largest network. “I really love to work at ABS. After I graduate, I’ll apply,” she said.